The “two MMs” are almost certainly Stephen McIntyre and Ross McKitrick, two Canadians who have devoted years to seeking the raw data and codes used in climate graphs and models, then fact-checking the published conclusions—a painstaking task that strikes us as a public and scientific service. Mr. Jones did not return requests for comment and the university said it could not confirm that all the emails were authentic, though it acknowledged its servers were hacked. Yet even a partial review of the emails is highly illuminating. In them, scientists appear to urge each other to present a “unified” view on the theory of man-made climate change while discussing the importance of the “common cause”; to advise each other on how to smooth over data so as not to compromise the favored hypothesis; to discuss ways to keep opposing views out of leading journals; and to give tips on how to “hide the decline” of temperature in certain inconvenient data. 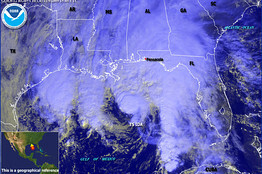 Associated Press A satellite image of Tropical Storm Ida. Some climate researchers claim that an increase in tropical storms is proof of anthropogenic climate change. Some of those mentioned in the emails have responded to our requests for comment by saying they must first chat with their lawyers. Others have offered legal threats and personal invective. Still others have said nothing at all. Those who have responded have insisted that the emails reveal nothing more than trivial data discrepancies and procedural debates. Yet all of these nonresponses manage to underscore what may be the most revealing truth: That these scientists feel the public doesn’t have a right to know the basis for their climate-change predictions, even as their governments prepare staggeringly expensive legislation in response to them. Consider the following note that appears to have been sent by Mr. Jones to Mr. Mann in May 2008: “Mike, Can you delete any emails you may have had with Keith re AR4? Keith will do likewise. . . . Can you also email Gene and get him to do the same?” AR4 is shorthand for the U.N.’s Intergovernmental Panel of Climate Change’s (IPCC) Fourth Assessment Report, presented in 2007 as the consensus view on how bad man-made climate change has supposedly become. Mr. Mann’s main beef was that the journal had published several articles challenging aspects of the anthropogenic theory of global warming. For the record, when we’ve asked Mr. Mann in the past about the charge that he and his colleagues suppress opposing views, he has said he “won’t dignify that question with a response.” Regarding our most recent queries about the hacked emails, he says he “did not manipulate any data in any conceivable way,” but he otherwise refuses to answer specific questions. For the record, too, our purpose isn’t to gainsay the probity of Mr. Mann’s work, much less his right to remain silent. However, we do now have hundreds of emails that give every appearance of testifying to concerted and coordinated efforts by leading climatologists to fit the data to their conclusions while attempting to silence and discredit their critics. In the department of inconvenient truths, this one surely deserves a closer look by the media, the U.S. Congress and other investigative bodies.